Across Toronto, throughout Ontario and into the rest of Canada, wherever you travel, this summer promises music to suit the most discerning listener. 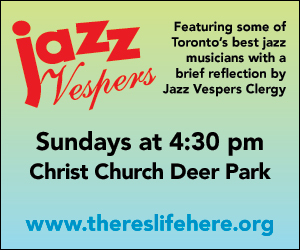 What follows is meant to augment our Green Pages supplement, concentrating on the Toronto Summer Music Festival in particular and highlighting other noteworthy events beyond the GTA. But the programming is not limited to such works; they become central to or merely part of a greater whole. For example, the Borodin Quartet’s two concerts that begin the festival do include Shostakovich’s intense String Quartet No.8 Op.110 (1960) dedicated “to the memory of the victims of fascism and war,” but overall spotlight Russian-themed compositions. So the Shostakovich is followed by Tchaikovsky’s String Quartet No.1 Op.11, which contains the famous Andante Cantabile melody. The next evening, July 13 in Walter Hall, Russian pianist Lukas Geniušas joins the Borodins for Shostakovich’s justly popular Piano Quintet in G Minor, Op.57 written in 1940 as WWII was just beginning. Geniušas opens the program with Rachmaninoff’s 13 Preludes (1910) then moves to Prokofiev’s Sonata No.7 Op.83 (1942). When I interviewed Geniušas two years ago he called the Prokofiev one of the central pieces of 20th-century piano music: flawless in form and matchless in its violent brutality inspired by the outrage of WWII. The overall arc of this year’s TSM ranges widely over the musical spectrum, encompassing a myriad of chamber music offerings, big band vocals, early music, gospel music, the pianism of Angela Cheng, lyric tenor Christoph Prégardien and a multi-disciplinary musical journey into the life of Francis Pegahmagabow, the renowned Ojibwe WWI sniper and decorated officer of the Canadian military. And of course, a series of concerts by art song and chamber music academy fellows is back, spotlighting a core element of TSM’s mandate in which musicians on the cusp of professional careers are mentored by, and perform with, seasoned artists. There are many instances where the war theme yields a bounty of masterpieces. Stravinsky’s L’Histoire du Soldat (1918), in which a naive soldier sells his soul (and his violin) to the devil, is an indelible concoction filled with memorable tunes and asymmetrical rhythms. Performed in its full version with narrator and dancer, the July 19 Koerner Hall performance presents a rare opportunity to experience one of Stravinsky’s masterworks. And what does it tell us about the human spirit that Copland’s sunny Appalachian Spring, with its unfailing optimism, was written in the last year of WWII? TSM will present this enduringly popular work, in its original version for 13 chamber musicians, on the same program. Messiaen wrote most of the Quartet for the End of Time after being captured as a French soldier during the German invasion of 1940. The premiere took place in an unheated space in Barrack 27, where the German officers of the camp sat shivering in the front row. “This is the music of one who expects paradise not only in a single awesome hereafter but also in the happenstance epiphanies of daily life,” Alex Ross wrote in The New Yorker. “In the end, Messiaen’s apocalypse has little to do with history and catastrophe; instead, it records the rebirth of an ordinary soul in the grip of extraordinary emotion. Which is why the Quartet is as overpowering now as it was on that frigid night in 1941.” Take advantage of the opportunity to hear this spellbinding work when Jonathan Crow (violin), Julie Albers (cello), Miles Jaques (clarinet) and Natasha Paremski (piano) perform it in Koerner Hall at 10:30pm on July 19. Crow and pianist Philip Chiu base their tribute to the great violinist, humanist and teacher Yehudi Menuhin (in Walter Hall on July 30) on concerts Menuhin performed at liberated concentration camps and military bases during WWII. The program, anchored by Beethoven’s Violin Sonata No.9 in A Major, Op.47 “Kreutzer,” includes works by Corelli, Ravel and Kreisler. More joyous music, in this case represented by Schubert’s ineffable “Trout” Quintet, seemingly apart from TSM’s war theme, is the feature of another Walter Hall recital, July 20. Taking advantage of the presence of art song mentors, tenor Christoph Prégardien and pianist Steven Philcox, the evening also includes Schubert’s song, Die Forelle, which is the basis for the theme-and-variations fourth movement of the quintet. Filling out the program are works by Shostakovich, Rachmaninoff (his unforgettable Vocalise) and Paul Ben-Haim (who fled the Nazi regime for Palestine). Another unmissable highlight of TSM’s musical abundance includes the pairing of two recent American classics in a July 24 concert at Lula Lounge by the New Orford String Quartet: Steve Reich’s haunting Different Trains, which contrasts the composer’s nostalgic feelings for the trans-American railway trips he made as a child in the early 1940s with the horrific train rides that Jews were forced to make at the same time in Europe, and George Crumb’s searing response to the Vietnam War, Black Angels (1970), written for electric string quartet. The following day, July 25 at the Church of the Redeemer, Jonathan Crow’s soloist role in Vivaldi’s Four Seasons is paired with Biber’s Battaglia (1673), a realistic instrumental depiction of war. Beethoven’s Sonata No.31 in A-flat Major, Op.110 and Chopin’s Ballade No.1 in G Minor Op.23 are major pillars of the piano canon. Angela Cheng performs them July 31 at Walter Hall before being joined by her husband Alvin Chow for three contrasting French works for piano four-hands by Debussy, Milhaud and Ravel. Ravel put all his disillusionment with the horror of WWI into La Valse, which takes an elegant waltz and ultimately twists it into madness and mayhem. Brilliant. The New Orford String Quartet and pianist Pedja Muzijevic’s program (July 27) mixes Debussy’s Sonata for Cello and Piano, written in the early days of WWI, and Beethoven’s “Serioso” String Quartet, which may have been influenced by Napoleon’s occupation of Vienna the year before it was written, with Elgar’s expansive Piano Quintet, completed just as WWI was ending. Chiu, along with violinists Aaron Schwebel and Barry Schiffman, are among the musicians taking part in two more chamber music concerts, one (August 1) bearing the weighty title “War in the 20th Century” and the other (August 3) focusing on a cornerstone of string players’ repertoire, Brahms’ Sextet No.1 in B-flat Major, Op.18. Apart from the mainstage events, there are reGENERATION concerts, in which TSM academy fellows and mentors perform together; and members of the academy also participate in lunchtime concerts. There are pay-what-you-can hour-long late afternoon performances by TSM artists and daytime chats that provide insight into the world of classical music. However much you decide to take in of TSM’s ambitious programming, you will be well-rewarded. Founder and artistic producer John Miller’s 18 years at the helm of Stratford Summer Music come to an end this year (July 16 to August 26) with a festival filled with something for everyone, from Bach brunches to the Blind Boys of Alabama, and Tanya Tagaq interpreting the classic silent film Nanook of the North. My personal must-see list has Marc-André Hamelin and Jan Lisiecki at the top. Miller has been trying to book Hamelin since day one; he’s finally got him in a typical Hamelinesque program that mixes the well-known -- Schumann and Chopin -- with the lesser-known: Weissenberg and Castelnuovo-Tedesco. Be assured that Canada’s greatest pianist will charm and astound. Lisiecki, who has been on a stellar trajectory over most of his young career, makes his ninth appearance in Stratford (and Miller warns it may be his last for a while, since he’s in so much demand). Getting an early start on summer, the Montreal Chamber Music Festival has several attractive concerts in mid-June. The Rolston String Quartet continues their Banff Competition grand tour pairing Shostakovich’s String Quartet No.7 (his shortest at 13 minutes) with Steve Reich’s powerful Different Trains (June 12). Later that night, the Rolstons and Andre Laplante perform Schumann’s iconic Piano Quintet Op.44. Amit Peled plays Bach and Bloch on Pablo Casals’ 1733 Matteo Gofriller cello (June 15). Four pianists (Alon Goldstein, David Jalbert, Steven Massicotte and Wonny Song) in various combinations play Mozart, Wilberg (his Fantasy on Themes from Bizet’s Carmen), Stravinsky’s Petroushka and more (June 15). The New York Philharmonic String Quartet (the principals of the famous orchestra) make their Canadian debut with a program of Haydn, Shostakovich and Borodin (June 16). The 39th edition of the Festival of the Sound is varied and extensive: from the world premiere of Sounding Thunder, Timothy Corlis and Armand Garnet Ruffo’s work honouring the renowned Ojibwe WWI sniper, Francis Pegahmagabow, to a series pairing Bach with Mozart, Debussy, Dvořák, Schubert, Schumann and Brahms; from concerts featuring the emerging pianist Charles Richard-Hamelin, to The Mosaïque Project, for which Ensemble Made in Canada commissioned 14 award-winning Canadian composers to each write a four-minute movement for piano quartet inspired by a particular province, territory or region, thus creating a unique musical quilt representing the diversity of Canada. The breadth and depth of this beloved festival on the shore of Georgian Bay continues to astonish. Under the artistic direction of father-and-son pianists Alexander and Daniel Tselyakov, Manitoba’s first chamber music festival is a long weekend of well-chosen repertoire set in Riding Mountain National Park (July 26 to 29). This year’s highlights include Alexander Tselyakov performing Mozart’s “Elvira Madigan” Piano Concerto No.21 K467 arranged for piano and string quartet; an evening of masterworks by Bruch, Poulenc and Dohnányi with Alexander and strings; Mozart’s Piano Quartet No.2 K493 with Daniel Tselyakov; and a midday seriously fun concert complete with coffee and pastries. A unique festival. Ottawa Chamberfest celebrates its 25th season July 26 to August 9 with a star-studded roster. Highlights include Marc-André Hamelin (July 27) extending his exploration of the piano music of Samuel Feinberg (and Chopin) as well as teaming up with the exceptional Danel Quatuor for Shostakovich’s Piano Quintet Op.57. Israel’s Ariel Quartet and Banff winners, the Rolston String Quartet, combine for Mendelssohn’s great Octet (July 30); Quatuor Danel (July 29) and the Rolstons (July 31) each give additional concerts. OSM concertmaster Andrew Wan and rising-star pianist Charles Richard-Hamelin play Beethoven sonatas (August 5); the Gryphon Trio celebrates their own 25th anniversary with an evening of greatest hits and favourite stories (August 5); the masterful Pražák Quartet delves into their Czech heritage (August 7); and Angela Hewitt brightens her visit to her hometown with programs featuring Bach’s Well-Tempered Clavier Book One (August 4) and Goldberg Variations (August 6). An oasis of calm downtown by the lake, Harbourfront’s Music Garden is one of Toronto’s best kept secrets. And it’s free! Now is the time to spread the word. Here are some highlights. The Venuti String Quartet (violinists Rebekah Wolkstein and Drew Jurecka, violist Shannon Knights and cellist Lydia Munchinsky) performs Ravel’s breathtaking String Quartet June 28; The New Zealand String Quartet illuminates Beethoven’s String Quartet No.7, Op.59 No.1 as well as Stravinsky’s little-heard Concertino for String Quartet July 19; Blythwood Winds, a classic wind quintet, present a program spanning the last century, including Elliott Carter’s Wind Quintet, Abigail Richardson-Schulte’s nature-inspired Emerge and music from the score to Disney’s Beauty and the Beast, July 20. Famous for their marimba-duo version of Ann Southam’s Glass Houses, Taktus (Greg Harrison and Jonny Smith) brings it all back home to Toronto on July 22. Playing violin, mandolin and the nine-string hardanger fiddle, Rebekah Wolkstein and Drew Jurecka perform music by Brahms, Bartók, Mozart and Grieg, along with folk music of Norway, August 16.